Hostel Pangea the first & long standing hostel in Costa Rica! Opened it's doors in 2000 and since then until today it has been the Lonely Planet author's choice as the #1 budget option ,we are the hostel with more bookings and reviews from all the capital city ! That tells you our experience. The hostel is located in the heart of the famous art Deco district, Barrio Amon and is an easy 10 minute walk from the main and biggest bus station, just 3 blocks away from the central square in San Jose. Our roof-top bar is incomparable to any around the city considering atmosphere, great specials and not to mention the breath taking views. We have a large communal area with a fully featured industrial kitchen, Free WiFi in rooms and all around the hostel, flat screen TVs, dining room and a large outdoor area. 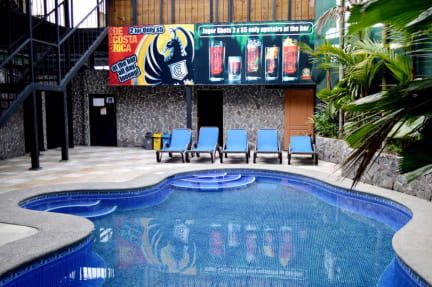 Hostel Pangea offers all the facilities a backpacker is dreaming for and more!!! We can guarantee you with us you'll get more bang for your buck than anywhere else ! Make sure you arrive on time, once you set your arriving time on your reservation we are going to give you one more hour if you do not show up at that hour we have the right to sell your room/bed. If you are coming with our airport shuttle don't worry your spot is safe! All the taxes are included in prices. Maximum night stay 31 days. Must have a valid passport to become a guest. * Cancellations and reservation changes must be made by email only. Pangea is great! No complaints. The staff were very helpful in booking shuttles, etc., and the beds are comfortable and the social spaces are nice. Overall this was a super neat hostel. The art along the walls was really cool but like the other reviews it was very mazelike and almost prison like. It was extremely clean and there’s was hot water. The staff are really helpful with directions and bus routes. It’s nice for a single night if you’re looking to stay in San Jose, but I wouldn’t recommend it if you’re trying to meet people. Clean. The architecture of the building is very interesting. Bar and restaurant had no guests, many food options not available, cash only. Food was pretty good, large servings. Hostel accommodations were nice, only stayed one night. Hostel was clean , shower doors didn't lock but I didn't really care ( but some people might ). Hostel seemed like it could be amazing. But just seemed really empty. Not the hostels fault. Food was decent if not a tad over priced for a hostel. Lockers were tiny ( it's a pet hate as I have to unpack valuables for one night to store them repack ). Great security on site though and no ransoms can walk in. Used as an overnight stopover before flying out of San Jose. Staff were very friendly and helpful, and security seemed great. Seemed a bit of a sketchy part of town at night but they have locked entry with a 24hr security guard. Amazing communal facilities, bar, pool, rooftop terrace and games room, really interesting design, but not many other people around. Private room was very basic, with very thin walls and internal windows. Reasonable value for a private room though. While the security was INCREDIBLE, the rest not so much. Our room had a private bathroom but smelled like a urinal the entire time. On night 2 of three we saw a cockroach in our room. The bed was seriously uncomfortable. We stayed in a tent the night after and had a better sleep. Not a good hostel to meet people, there was never anyone around. Being solo would be hard here.Area is good but DO NOT GO OUT AFTER DARK, probably all of San José, but this area is very close to the red light district. Did not like the atmosphere of the place, did not promote community within the hostel and the location was kind of sketchy. Not much nightlife around the hostel. When we arrived the showers did not work at all. Most of them did not have locks. The hostel was very, very cold. While there was a bar and plenty of social areas, there didn’t feel like a friendly vibe. I wouldn’t recommend it.